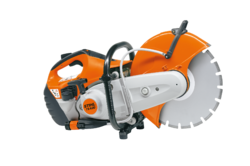 Our range of products include stihl cut off saw machine, petrol engine cut off saws machine and stihl concrete cutters. 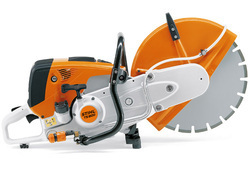 We are offering Stihl Cut Off Saw Machine to our clients.The TS 410 is a lean, clean, cut-off machine that’s easy to use and easier to maintain. Just squeeze the trigger and watch its 12” cutting wheel grind through iron, steel, concrete and expectations. Part of our STIHL Cutquik® series, this model features advanced filter technology that automatically handles daily maintenance. Its revolutionary X2 air filtration removes 99.96% of particles from air entering the carburetor and engine, making its onboard filters virtually maintenance free. Good thing we included an anti-vibration system to maximize comfort – a feature you’ll appreciate after a full day of cutting. We are supplier of STIHL brand Gs 461 Concrete Cutter to our clients.